Faster than any other big city, Seattle is losing its lowest-earning residents. A UW public-policy professor thinks that while some are being forced out by rising rents, the strong economy is probably helping more climb to higher income levels. Seattle — faster than any other big city — is losing its lowest-earning residents. In just one year, the number of households in Seattle earning less than $35,000 fell by more than 13 percent. 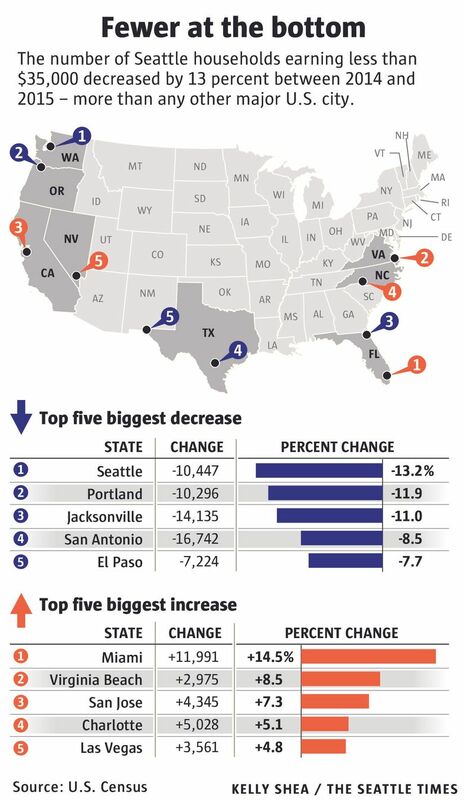 That’s the biggest drop among the 50 most populous U.S. cities, according to my analysis of newly released census data. 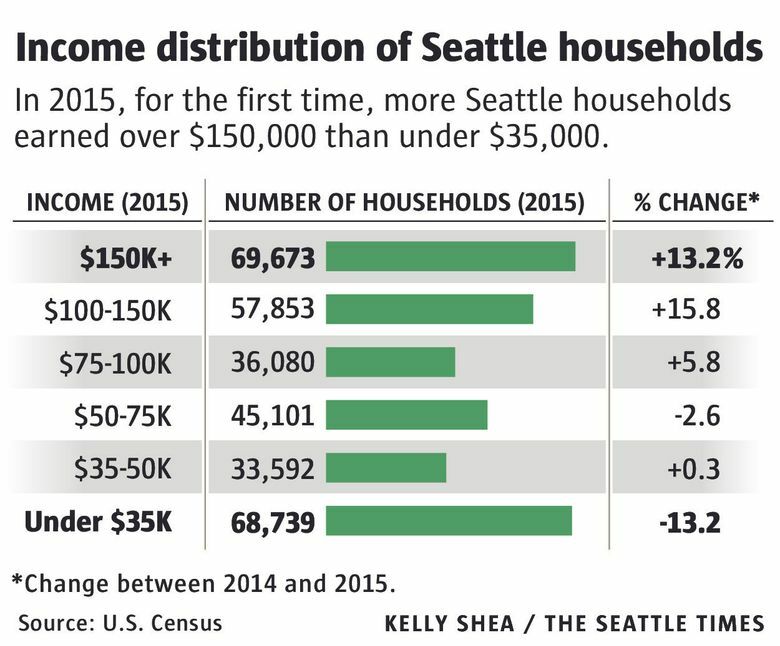 Seattle shed more than 10,000 households at that income level from 2014 to 2015 — a loss of 200 per week. That seems to support the many readers who asked “is Seattle just for the rich now?” after I reported that our city’s median household income soared to $80,000 last year, according to the census data. Indeed, the data also show that Seattle households earning more than $150,000 grew by 13.2 percent — the exact same rate that the city lost households earning less than $35,000. It’s true that poorer people might simply be leaving, priced out of an ever more expensive city. But there’s another possibility: Some folks at the bottom income rung may be climbing up the economic ladder. “It’s probably a mix of both of those things,” said Robert Plotnick, professor of public affairs at the University of Washington’s Evans School of Public Policy & Governance. In April 2015, the city’s minimum wage increasedto $11 for employers with more than 500 workers in the U.S. The minimum for those employers went up again to $13, or $12.50 with medical benefits, at the start of 2016. Plotnick doesn’t discount the idea that poorer people also are leaving Seattle.